To Cite: Vahdat M, Rokhgireh S, Mousavi A S, Tahermanmanesh K, Khodaverdi S, et al. Retained Suture Material Post Cesarean Section: A Case Report, J Minim Invasive Surg Sci. 2016 ; 5(4):e42295. doi: 10.17795/minsurgery-42295. Introduction: There are different causes of abnormal uterus bleeding. Foreign body is a less common etiology due to the increasing rate of cesarean delivery. We are confronting some uncommon complications of cesarean section. Uterine incision closure is a substantial step in cesarean section. Since suture material hydrolysis is affected by patient different features, impaired suture material degradation in uterus scar may cause some complications like abnormal uterine bleeding. Case Presentation: We reported a 49-year-old woman who had abnormal uterine bleeding with prior history of multiple cesarean section. During hysteroscopy, abnormal mass was seen in anterior surface of uterine cavity compatible with the level of internal os. Polypectomy and removal of foreign body followed by endometrial curettage were performed. After hormonal assay and sonography evaluation, the patient underwent hysteroscopy and foreign body was observed in anterior surface of uterus. She was followed and visited 6 month after operation and she had no abnormal bleeding. Perhaps this foreign body led to abnormal uterine bleeding. Conclusions: Patient characteristics has important role in suture material degradation. Impaired suture hydrolysis in uterus incision may cause abnormal uterine bleeding. It is interesting to demonstrate whethersuture degradation in previous cesarean section has a role in formation of placenta accrete or not .This issue needs more investigation. Because there is no similar case in literature, we cannot compare our article with others. There are different causes of abnormal uterus bleeding. Foreign body is a less common etiology due to the increasing rate of cesarean delivery. We are confronting some uncommon complications of cesarean section. Uterine incision closure is a substantial step in cesarean section (1). Most famous kinds of suture material which are used for uterus suturing in cesarean section are vicryl and chromic which are absorbable sutures. Based on personal characteristic, suture material degradation is different (2, 3). The aim of this case report is to show that abnormal uterine bleeding in patient with previous history of multiple cesarean section, may be associated with un hydrolyzed suture material in uterus incision. It is interesting to demonstrate whether suture degradation in previous cesarean section has a role in formation of placenta accrete or not .This issue needs more investigation. Because there is no similar case in literature, we cannot compare our article with others. A 49-year-old woman gravida 4 para 4 was admitted to our outpatient clinic presenting with menu metrorraghy for 2 years. She had a history of 4 times cesarean section. She had her last cesarean section 17 years ago. She had vaginal discharge but she didn’t complain about any pelvic pain and dysmenorrhea. At vaginal examination, there was no vaginal discharge; uterus was partially fixed, and it had myomatosis consolidation. Ultrasound evaluation showed two subserousal myoma in fondus and anterior wall of uterus measured 30 mm. Endometrial thickness was 3 mm. No adnexal mass was seen. Hormonal assay was normal. Intra-operative findings in hysteroscopy were adhesive band; intra uterine synechiae and polyploidy lesion. 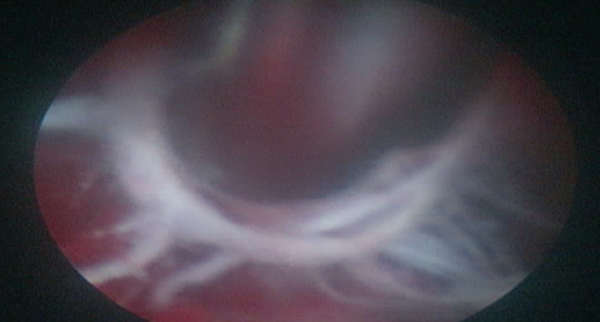 During hysteroscopy, abnormal mass (Figure 1) was seen in anterior surface of uterine cavity compatible with the level of internal os. Polypectomy and removal of foreign body followed by endometrial curettage were performed. Pathologic study revealed foreign material with mild acute inflammation, granulation tissue and tiny fragment of exocervical mucosa and end cervical gland. Her post-operative care was uneventful and she was discharged home on the 4th day post operation. She was followed and visited 6 month after operation and she had no abnormal bleeding. Perhaps this foreign body led abnormal uterine bleeding. Absorbable suture breaks down over time in the body. Examples of absorbable suture include Monocryl, Vicryl, chromic, and PDS. The amount of time which lasts to break down in the body depends on several factors such as suture type, size and the location which suture used in. Suture hydrolysis is influenced by fever, infection or protein deficiency. Most famous kind of suture material which are used for uterus suturing in cesarean section are vicryl and chromic. Vicryl (polyglactin 910) is an absorbable, synthetic, usually braided suture which is used for soft tissue approximation. The tensile strength is held approximately for 2 - 3 weeks. Completely absorption is done by hydrolysis within 56 - 70 days. Chromic catgut is an absorbable biological suture material. Chromic is made by purified collagen taken from bovina intestines. Chromic is absorbed byenzymatic degradation. Proteolytic enzymatic digestion is completed in 70 days (4-6). In suture material hydrolysis, Chemistry and polymer morphology alter suture performance specification. Main clinically particular characteristics consist dimensional resistance, Mechanical properties, rate of mechanical properties loss, and rate of absorption. Chemistry has a dominant role in assigning hydrolysis rates, these afterwards significantly affect tissue absorption profiles and biological compatibility (7). If a material undergoes inappropriate rapidity of hydrolysis, the tissues at the suture material place may not be able to maintain a proper pH, thus causing inflammation (8). It is obvious that hydrolysis rates can be influenced by ionic strength and other factors (9). Whereas absorbable suture materials have been used for uterus suturing in cesarean section, presence of suture material was meant as impaired hydrolysis and it caused abnormal uterine bleeding for patient some years later. Based on literature, the degradation time of sutures is determined by some patient individualism and function of size and chemical composition (10, 11). Patient features such as temperature, PH, and protein deficiency contribute in suture hydrolysis. Patient characteristics has important role in suture material degradation. Impaired suture hydrolysis in uterus incision may cause abnormal uterine bleeding.